A Complex Eductor for the Boeing 777 APU (Auxiliary Power Unit). The Boeing 777 relies on just two wing engines to provide thrust for flight. Thus, in its development, engineers determined that no other power should be bled off them for system hydraulics, and designed a space in its tail for a third, auxiliary gas turbine engine, or APU (as found in numerous other aircraft). 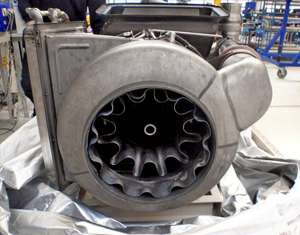 To remove heat generated by the APU, an axial, vane type fan, driven off the APU gearbox, is usually provided to pump cooling air past the oil cooler and the compartment. 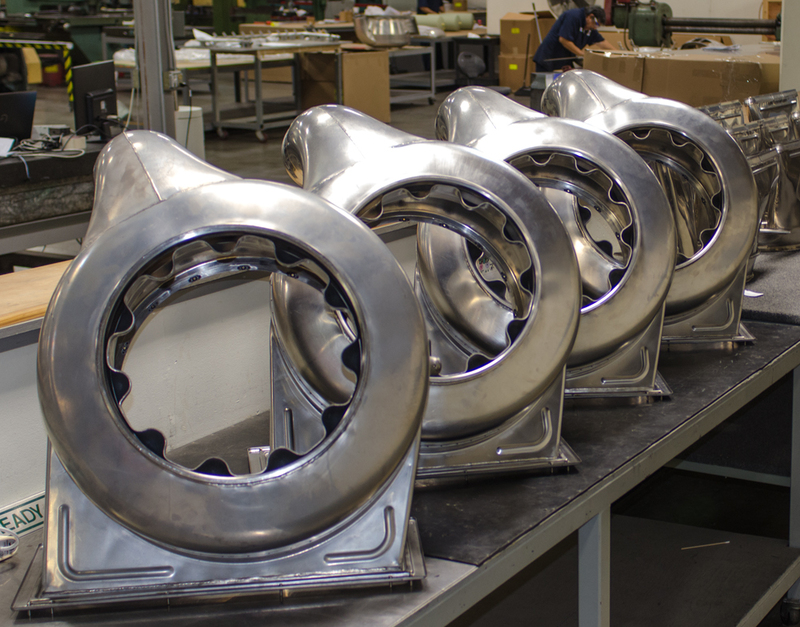 But because of the high speeds and rotating parts, these fans are susceptible to mechanical failures. When they do occur, it requires that the aircraft be removed from operation. Further, these fans sometimes leak oil into the cooling flow which then covers the oil cooler fins resulting in reduced heat transfer and the possibility of an APU automatic shutdown because of excessive oil temperature. 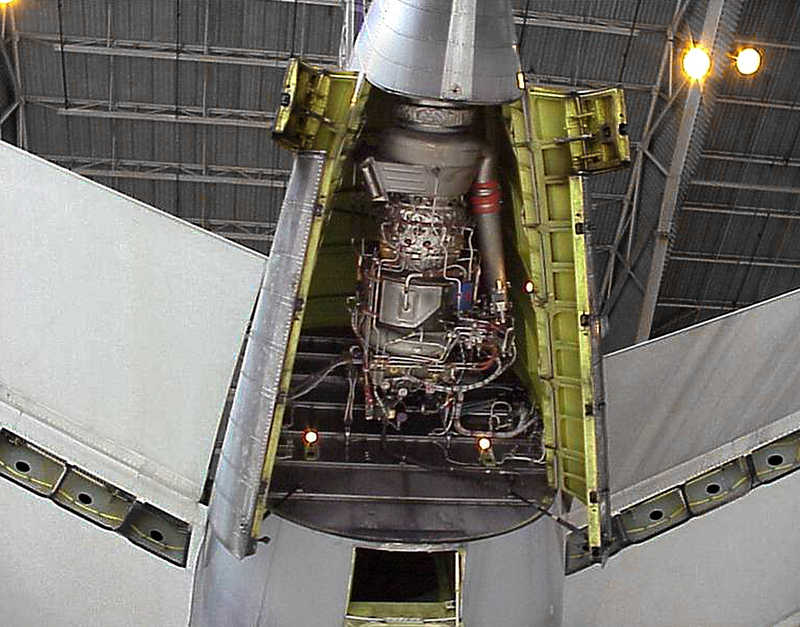 This engine, a Honeywell 331-500, is unique in that it is the first to use an eductor at the tail end to circulate air around the engine and to cool the oil. It does this by using the kinetic force of the engine’s exhaust to create suction, which draws cold air into the compartment. And it does so with no moving parts. ACE was chosen as the second supplier to build these quite large and very strong units. 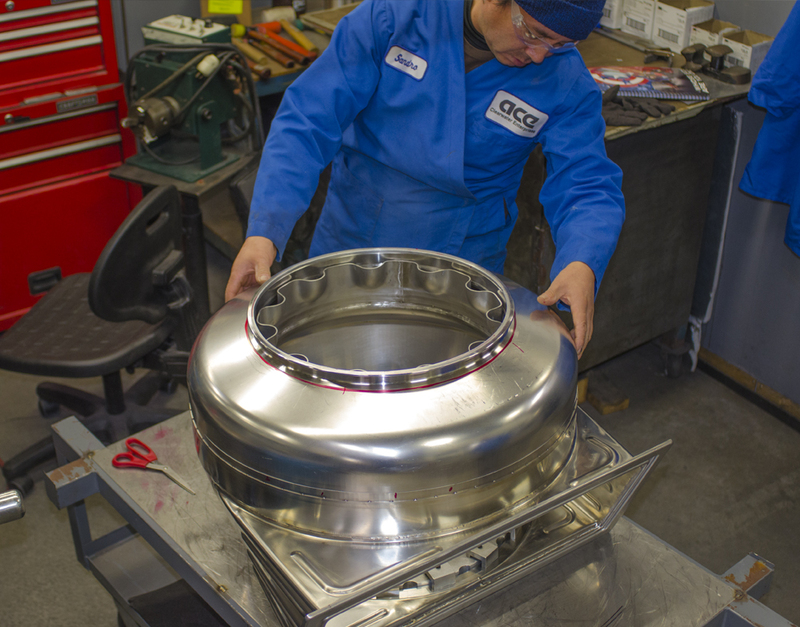 ACE’s unique capabilities enable us to build the units with less individual sections, and therefore less welded seams – making them far stronger and less subject to vibration failure. 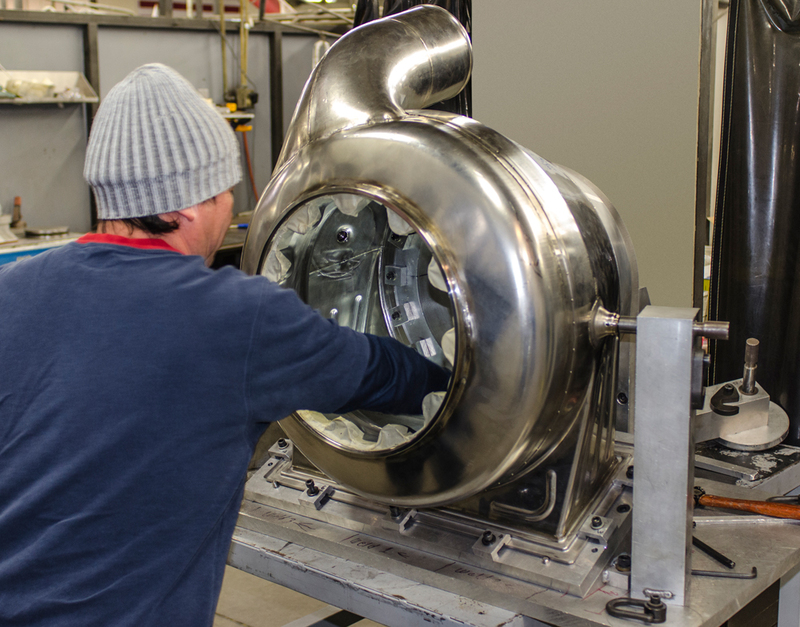 First, the shell and supports are formed in our drop hammer facility. They are formed on massive dies, which ACE carved from huge solid blocks of Kirksite, using 3D software and our large format CNC milling machines. 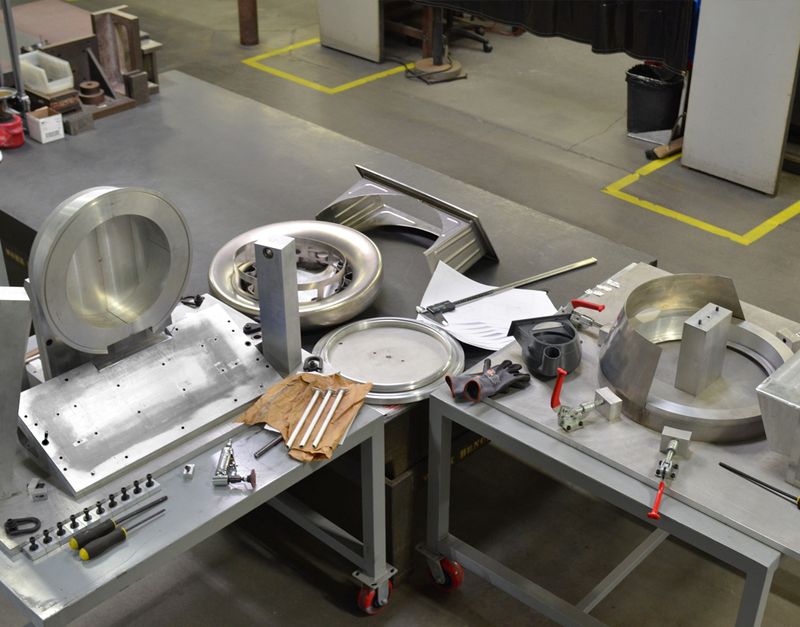 Once they have been laser-trimmed, they are transported to the assembly and welding work centers to be constructed. Once complete, the eductors go through a battery of dimensional measurement tests with a blue light laser, pinpointing 52,000 individual measures per second and feeding the information into software which compares the finished piece to the original digital 3D model. 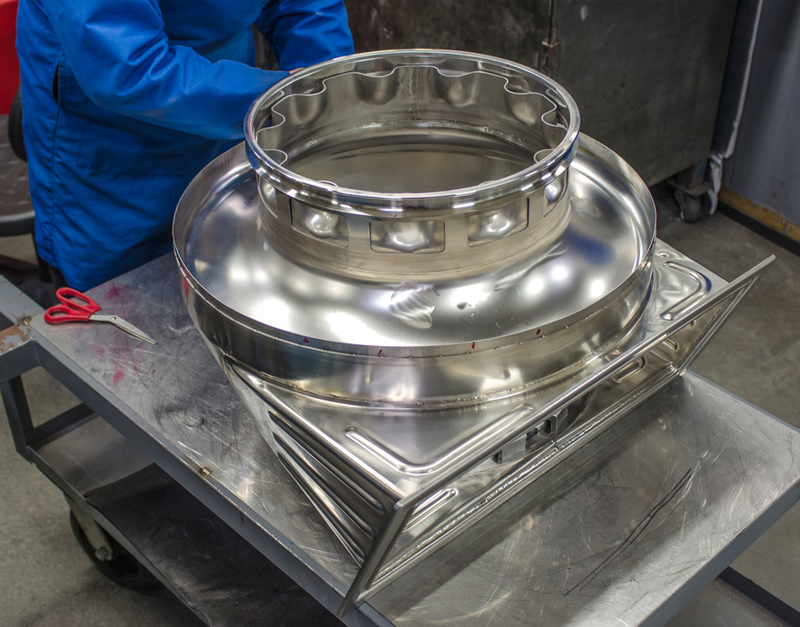 Standing nearly four feet tall and weighing 40 lbs., they still require strict tolerances of 1/1000 of an inch, a remarkable achievement and a testament to our ACE Welding and Assembly Team. Our engineers worked with Honeywell on ways to reduce the overall number of elements, reducing the welds and strengthening the eductors. 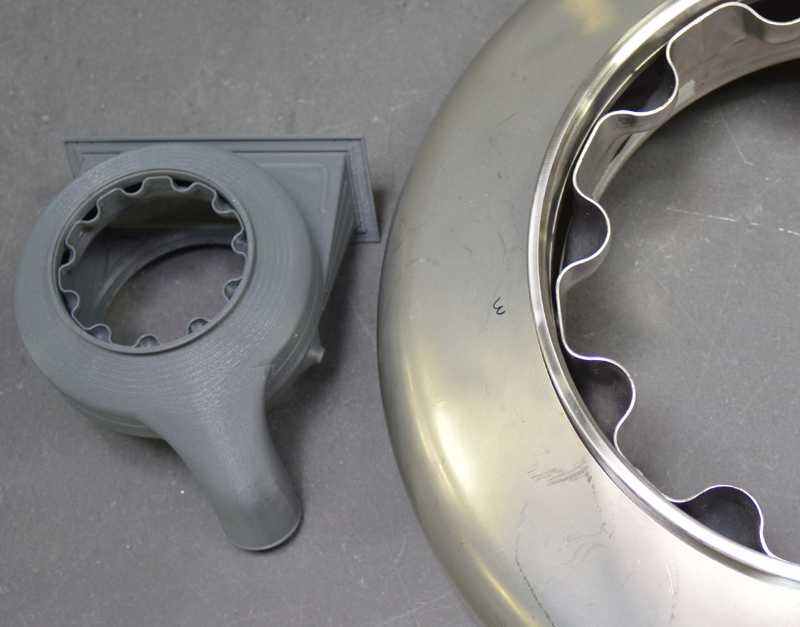 A 3D printout to scale provided many insights which improved the manufacturability, reduced labor hours and increased efficiency of production. The eductors reside in the tail section of the Boeing 777, and utilize the force of the gas turbine engine exhaust to create a vacuum which then pulls cold air into the compartment from the outside to cool the engine. 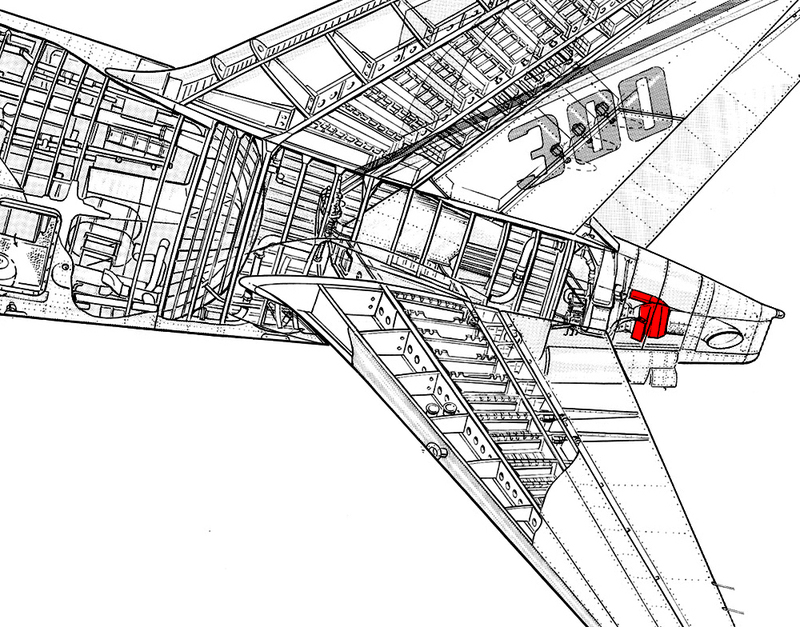 This image shows where the eductors are on the Auxiliary Power Unit in the tail. Extreme temperature changes, severe vibration, wind force and changing pressures require these units to be built with incredible strength and high tolerances. 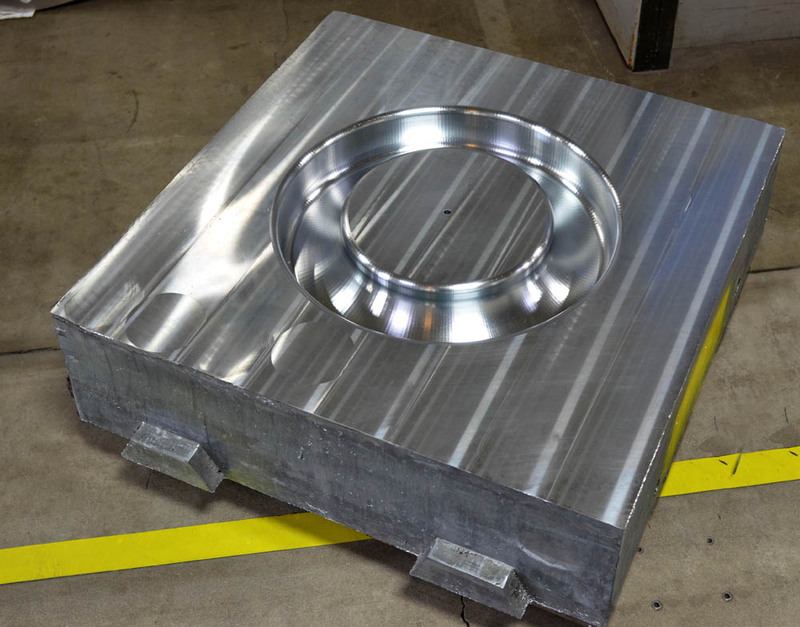 Once the design was finalized, huge dies were milled out of massive blocks of Kirksite on our large-format CNCs – for use on our giant hydraulic presses. 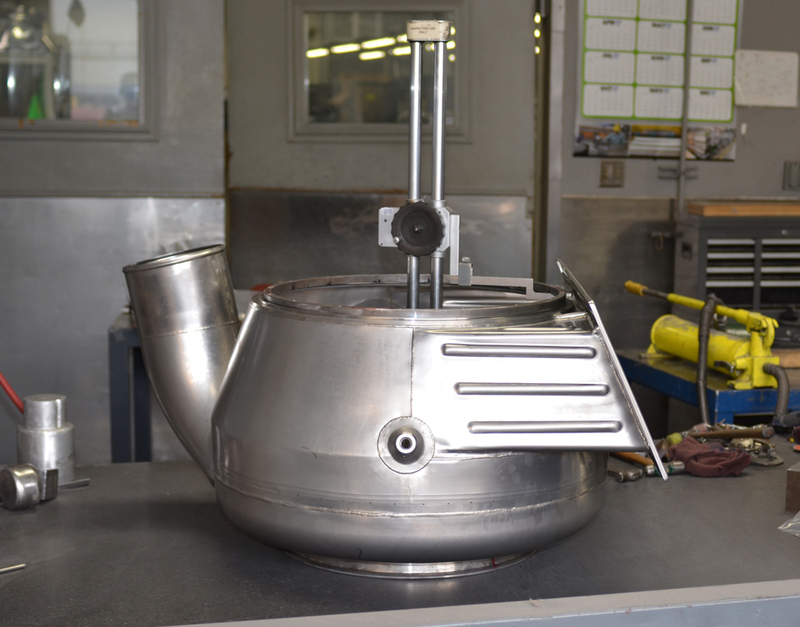 Special fixtures were engineered to insure individual pieces were held in exact position for assembly, tacking and welding. Here is one mounted into the fixture and clamped together, ready for tacking. The welder has a special round-headed hammer to gently tamp out dimensions, to make the top cowl fit perfectly to this base. Inside the interior of the eductor. 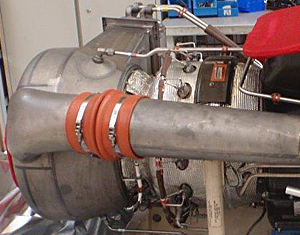 The unique ribboned slots use the APU's exhaust to create a vacuum which draws the cold air into the compartment from outside the aircraft to cool the engine. This device, or tool, is a fixture for the inner ribboned cowl that encircles inside. Welders use the clamps to adjust the waves in this part before it is mounted to the eductor interior. Throughout the process, measurement with certified micrometers insured each unit was to exact specifications. At every step of the process, special tabletop micrometers are used to insure the units stay within strict tolerances. 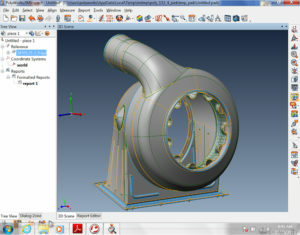 Once completed, special 3D software is used to compare measurements of each with the original 3D model, to highlight any variance. Each are checked in Final Inspection for measurement accuracy. 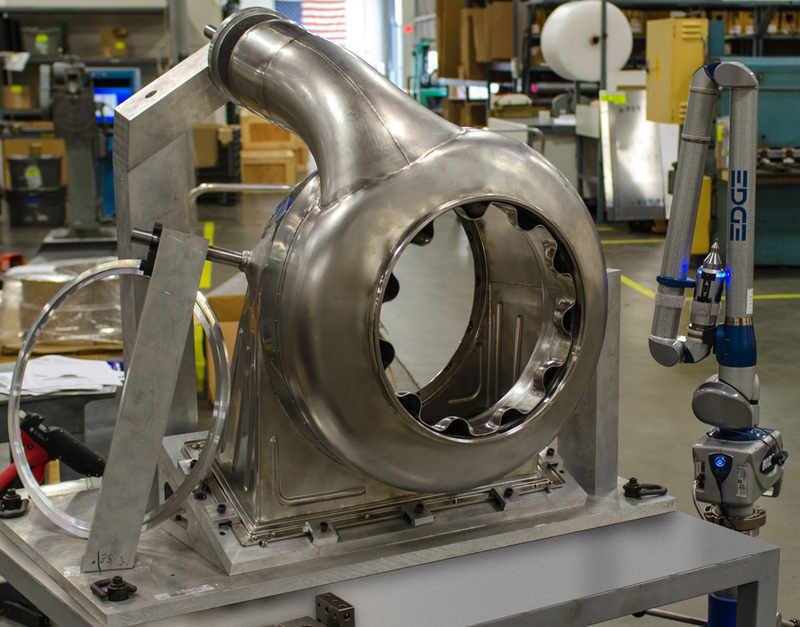 ACE uses a blue-light laser on a FARO arm, which scans the units in three-dimensional space taking an incredible 52,000 measurements per second at an accuracy of 1/1000th of an inch. ...all with the goal of producing eductors in quantity for our customer, on time, flaw-free and ready to install on the 777. The original eductors were made by Allied Signal. This photo from 1999 shows the many sections and welds used in the first design. This side view reveals even more separate elements which required additional welding. The Teams at ACE brought the new and improved Eductor to life –a true Build-to-Print success story. Our engineers worked with Honeywell on ways to reduce the overall number of elements, reducing the welds and strengthening the eductors. 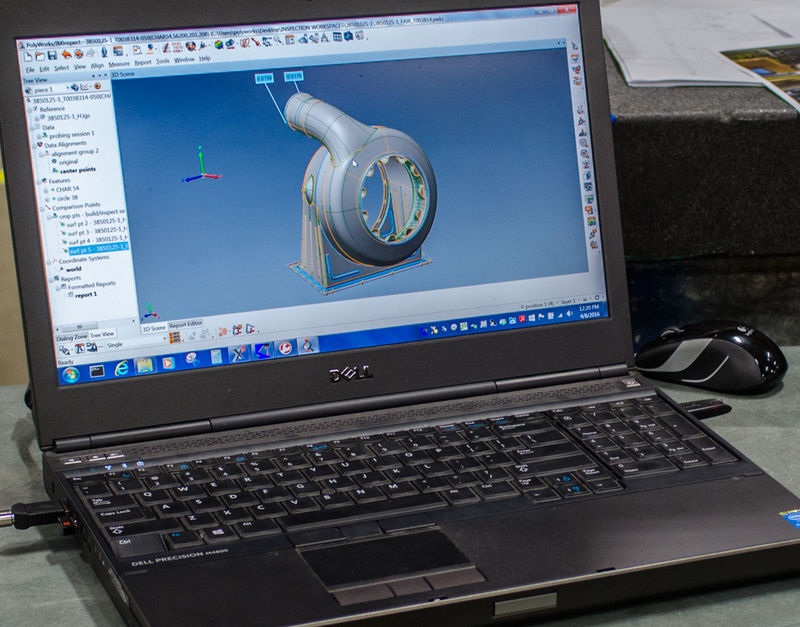 3D modeling software was used throughout the project, starting with engineering analysis of 3D printed examples, during prototype fabrication, to program our large-format CNC mills, and at Final Inspection, to insure each met Honeywell’s strict specifications. The original eductors had more than twice the number of sections to be joined by welding. By utilizing our Drop Hammers, laser cutting tools and modifications, the reduction of welded joints add up to far stronger structures. 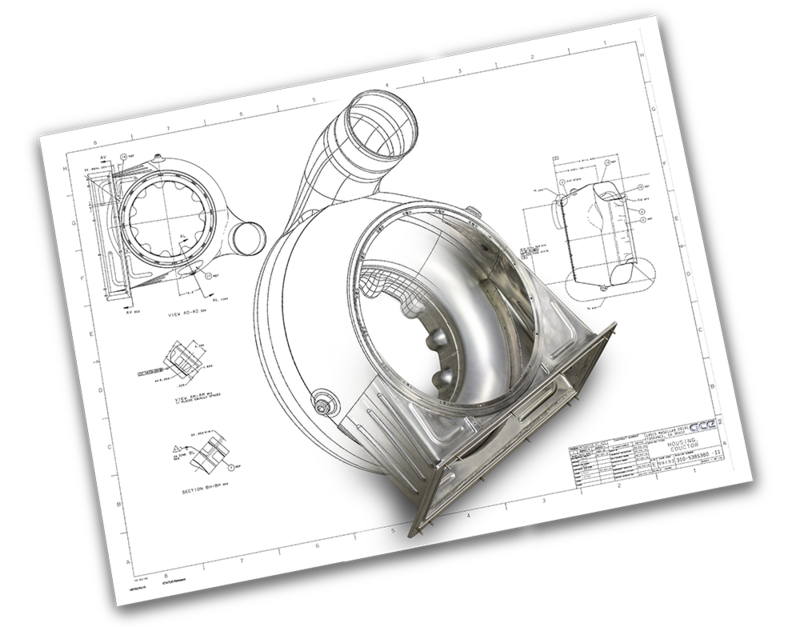 The original design from 1994 had more than 35 separate sections, or pieces, which edited not just more welds that reduced overall strength, but also added three times the time it took to make the devices. We the help of ACE, Honeywell's new eductor is far more efficient to build, and longer lasting than the original design. 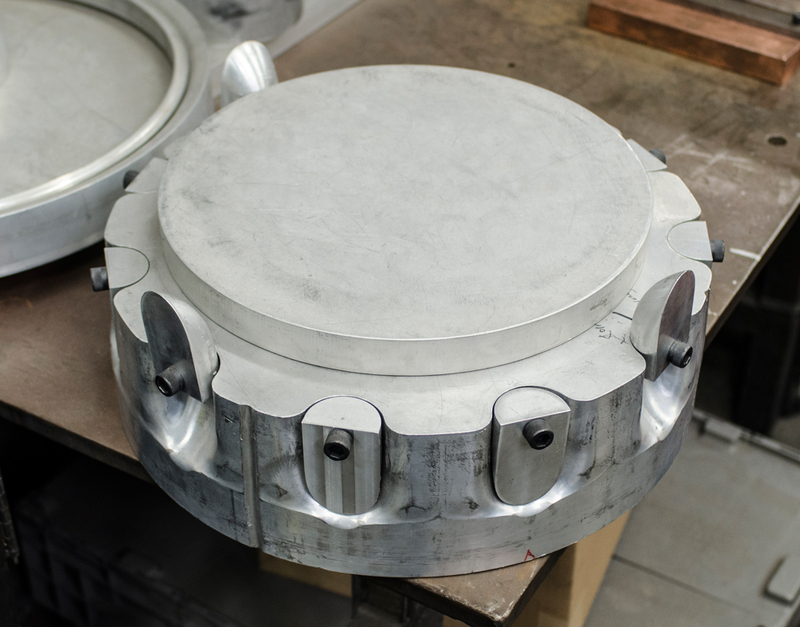 Making the cowl, the body, the square base flange, and the air connector tube – each in one piece – added tremendous strength to the units. 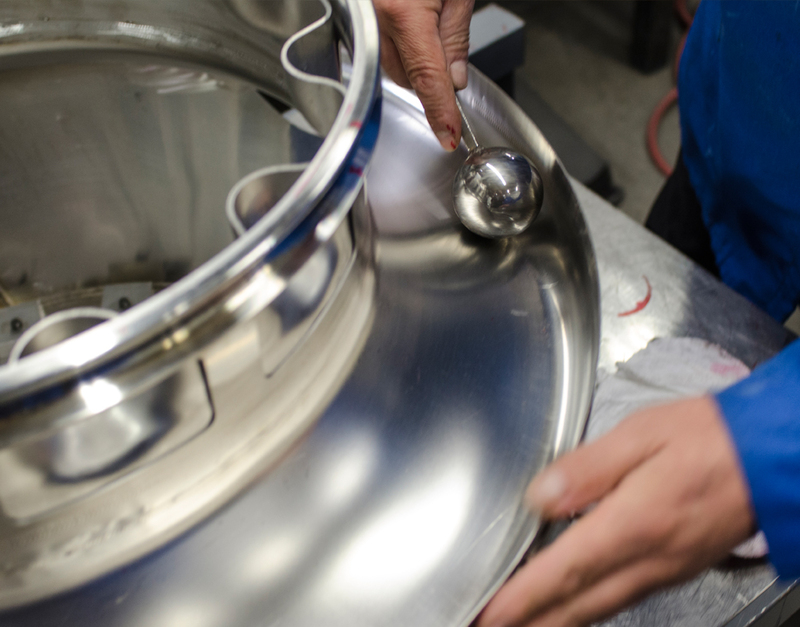 The forming of these elements, the laser trimming, the tools to accurately build, the welding and finished assembling – all happened within our facilities.